Stuff I Know » or at least, i ought to know . . .
or at least, i ought to know . . .
On the occasion of my parents’ 60-something (sparing the details!) anniversary, I wanted to write some stuff about them. I usually find myself writing about my sons, and talking about them when I’m not writing. Today will be different. I think . . .
“She’ll be pleased,” I said and smiled. I suggested maybe he’d just want to get her a big hammer so she could hit him in the head with it . . .
Well, I’ve nearly lost my train of thought, but if I could find it, it would be something about wrapping paper. About how all this: Christmas Pageants, shepherds, camels, sheep, Stars of Bethlehem, hay, Mary, Joseph, pick-axes, dump trucks, big hammers, and Palestine . . . how all this is wrapping paper for the World’s most awesome Gift. When I look at my life, and my wife, and our sons and their wives, and our parents, I understand that God still stops in the midst of hurry, crowds and noise to give us exactly what we need . . . a forgiver and a leader wrapped in swaddling cloths, His beginning in a manger. Happy anniversary mom and dad. Thanks for giving me a lift up to this place where I can see the Baby asleep on the hay. Enjoy the Frankincense and Myrrh. I think Talbot’s is keeping watch over the Gold by night! In a New Testament theology class I took a few years ago—or a little longer ago than that—we heard the following, and it’s one of the things that have stuck with me over time. “The Kingdom is where the King is.” So, when Jesus said stuff like, “The Kingdom of God has come near you…,” well, you can see what that means. There’s no secret ‘round here that Christmas is my favorite time of year. I perpetuate the season with music and other symbols for months after, and start thinking about it well before most folks do. The first turning-leaf of Autumn makes a sublime suggestion to my inner Christmas calendar. I like all of it. Decorations, shopping, music, bell-ringers, uncharacteristic goodwill, and even jolly elves make my season bright. I bet my parents would tell you i’ve always been like this. But, about 40 years ago I started paying attention in a different way. A way that made me feel like a member of the home team, you might say. Over those 40 years I have heard and read lots of sermons, messages, and, these days, blogs, about how bad it all is; how the whole thing is too commercialized and secularized and consumer-driven, and blah, blah, blah. These messages come from other folks who feel like they are part of the home team, too. Often, it seems these messages come from folks who seem to think they’re the first ones to ever discover this valuable truth about the sad state of Western Christmas. They’d tell us that the sappy message of Tiny Tim is beside the point. They might say that lights and colors are far from the images of “Real Christmas.” I’ve heard them say that spending money at department stores or, Heaven forbid, WalMart, is just a disgusting practice devised by the “whoever” to distract us from true meaning. See (they might say), we’re deluded and think that what we “feel” is a real “Spirit of joy” that couldn’t possibly be from God. Well, duh. Of course all that is apparently true. Of course Jesus didn’t come so that I could get cool electronics or bow ties on a cold day near the end of December. Of course there’s more to it. But I still maintain that Christmas, even in its current state, is Good for the Kingdom. Remember, The Kingdom is where the King is. The missionaries will tell us that, in every culture, there are allusions and analogies to the Good News of Christ. It must be so, friends, for we are all created in His image. Therefore, His fingerprints must be everywhere. One of the most visible prints in our culture is this season of Christmas. Tell me a time or occasion in our cultural lives during which more people lean in, and listen with attention to stuff about Jesus. Not even on Sunday mornings do we get so many people ready to “get with Christ.” The worst of us put up a manger scene on an end-table or a bookshelf. Even folks we wouldn’t think of as being on the home team send us cards with blessings inscribed. Might i suggest that, during this time when so many are leaning in, we of the home team refrain from throwing rocks at that which they lean toward? Rather, might we use the momentum to draw them in? Jesus is the King. His name is also Christ. The Kingdom is near whenever His Name is mentioned. I know, some people use an X, and some people say Happy Holidays instead of Merry Christmas. By now, however, in our culture, we know to what they all refer: Christmas! And before you can sing “Jingle Bells” backwards, the Kingdom is near! I hope you’ll relax this year, and breathe in even the notions of Peace on Earth and Mercy Mild. May more and more men and women, boys and girls be, with God, reconciled. And I wish you all of it. The Kingdom is Near. Praying for you all, always. Here’s a story I like to repeat whenever I get the chance. It’s in regard to having a relationship with God through Jesus Christ. When we say “yes,” Jesus takes us to himself. “You will probably hear him saying that he loves you.” We sense his love, and it is profound. It is like no other love we have ever experienced. Then, he puts Himself inside us through the indwelling Holy Spirit. Once there, at our “yes” invitation, he begins to change us from the inside-out. We will notice that our desires begin to change. Things that were dead inside us are now being awakened. The Holy Spirit is nudging us toward becoming more like Jesus. As he begins to change us (by living inside us, and through us), he also gently begins to turn us around to face the world and culture—the community—from which he has just rescued us. He goes with us (he’s inside us, right?) as he releases us back in to that world. Now we are there no longer as mere consumers of life and culture, but we are there with Him, as agents of this new life, for the sake of others. His desire from the beginning has been to “put things to right” in the world he created. We become his cooperative friends in that mission. We link up with others who are on that same mission, who have said “yes” to God’s call. A “Lord” who loves us? A Master who desires our friendship and our good? Benevolence doesn’t usually enter the equation when we say the words lord, master, or even “boss.” So, for our new Lord to lead with “I Love You” is a new thought. But we begin to get that he loves us as we learn about his death and resurrection. Those are usually the first things we learn about him in order to open the door for us to have a relationship with him. Then we begin to hear his teaching through which we understand the Love of God for us, the love we sense for others (he’s working in us), and how to respond to a world culture that needs to be Loved in this different way. I think that if we think we will go on loving ANYONE as we did before, we are confused. This is Love of a different kind. Today I had a few moments when I heard the Spirit whisper, “I love you, Mike.” It made me then respond, “Ok, let’s go clean up the yard together.” That may sound sort of superficial, but for me it was a way of illustrating, and experiencing, that surrender to him is a full-life experience (Raking leaves with JOY!). Just like I am, right where I am, he loves me…and it’s not weird. But, I remembered how Jesus said, “Make yourself at home in my love.” (John 15:9 MESSAGE) Doing so changes me. Things were beginning to settle down around here. We’d had lots of activity over the last couple of weeks, including a wonderful celebration of Christmas with family and friends. For several days since, however, Windy and I had been down with a bug. The intestinal kind, you know. We even missed the New Year’s Eve wedding of James and Samantha because of it. Not much fun, let me tell ya. I don’t know about you, but sickness is a really interesting adventure for me. I don’t like feeling badly. I don’t like feeling uncomfortable. I don’t like it when it hurts. I’m talking about the kind of sickness that seems to separate one from one’s ability to think straight or carry on even simple activity. It messes with my ability to think about praying. On that Saturday Windy and I mentally reached that place at which we were trying to decide if we wanted to die at home, or at the hospital, or maybe on the way from home to the hospital. Someone described it as the feeling that you hope you don’t die, and then hope you do. We both say we don’t ever remember being that sick. Well, there was the time when, as a young husband, I took my also young wife to the Hilton Head hospital because a bug had rendered her dehydrated. She really felt miserable, and wasn’t helped by the fact that she was already tiny (105 lbs. soaking wet with a brick in each pocket) so the nurses had a hard time finding a vein in which to put an IV. She was pretty sick then. Back to this recent weekend: Nurse Enola dropped off Gatorade and other supplies Saturday evening, and we did perk up a bit. But Sunday afternoon I relapsed and developed a huge headache to go along with everything else. How God answers a prayer is often also an adventure. Of course we can’t always even track His answers. Ned says the problem is that God sometimes takes forever to do things (a fair paraphrase, Ned?) so tracking is difficult. Worship is better than asking. But I know that. I know that Jesus wants me. I know that the gift is never given apart from the Giver. And I know that it’s ok to ask. “Ask and it will be given to you. Seek…Knock…” When we knock, we should probably expect to see the Savior’s face when the door is opened. I’ll not try to engage any theological proof of all this. I might do that if I weren’t afraid that even my mother is probably already tired of reading this. Save it for a discussion some time. I do know that we can’t draw doctrine from our experience. Sometimes, though, our experience illustrates “something true about God.” (Tozer) I think this is one of those times. So, if Worship is better than Asking, I want to get better at Worship. If Worship is better than asking, how powerful does that make Sunday morning? I know worship is more than just Sunday, but Sunday is really good, huh? Or it should be. What power is within our grasp as we, with our friends and members of our communities “Bow down and bend the knee, and kneel before the Lord, our Maker! ?” Kinda sounds like something good, doesn’t it? May we all get better at Worship in the coming years. Windy and I will try to find more ways of migrating our times of prayer for you into times of worship referencing you. Can we “worship on your behalf?” Can we, in worship, mention your name in the Presence? I will be seeking that. What are your personal worship habits? I mean habits that are not about asking, or even praising, but worshiping? I’d like to incorporate some of your thoughts. My friends from from missionary school may have good ideas to add, as our mentor “coached” us about this stuff, right? I look forward to hearing from you. Peace to your house, and blessing to you all. *The Jesus Prayer: Bob Mitchell taught us about this. As best I can tell it comes from Luke 18, and from a little book called, “The Way of a Pilgrim.” This great little book is translated from Russian, written by an unknown peasant about his journey and his attempt to learn to pray without ceasing. The Prayer itself has a few diverse forms, but here’s the version I learned . . . This is Achilles. He is virtually invincible. Seriously. Achilles is a great little guy we fostered for a bout a month for the Lab Rescue folks here in our town. 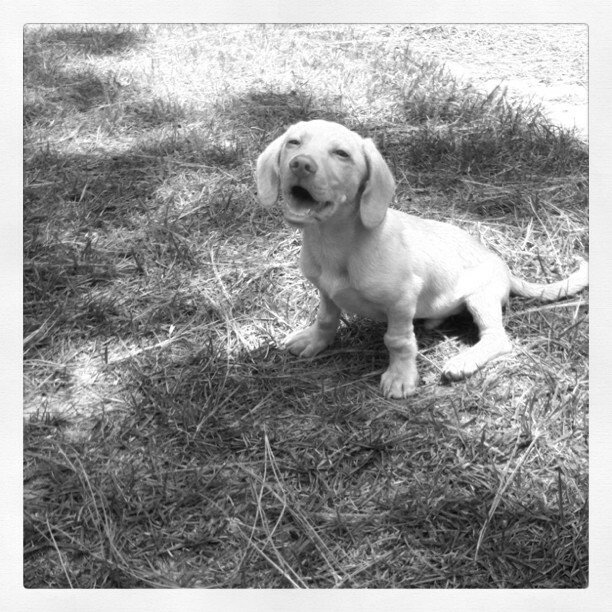 He’s a Lab/Basset mix–they’d call him a “Bassador,” I called him a “Labass.” He came to us as “Mack” along with his brother, “Mick.” Mick was adopted the day after they came to live with us. Mack, or Achilles as he is now known, got pretty sick a few days later, and remained so for much of the month we had him. You can’t see it in the picture so much, but his two forelegs were mostly shaved so he could have fluids via IV, and his belly was shaved half-way up his sides so they could do an ultrasound to try to see what was going on. He probably had 20 shots of something or other while he was with us, and had about as much medicine as he did food. To survive all that, he really had to be invincible. But cute the whole time. There were some days when he would just wander off and find a place to lie down. We thought he was looking for a place to die, maybe. But most days he would try his best to play to the extent of his energy, and then sleep. He got to know us very well, and was quite comfortable in our house, on our sofa, and under the drop-leaf table. He had this thing he would do outside. We’d walk him to one side of the yard where he was most fond of doing his “business.” Then, we’d turn and walk back toward the deck. He’d come running and pass us. About three feet in front of us he’d duck his head and roll, finishing the move on his back with tail wagging, waiting for that tummy rub. It was cute. A nice young woman from Virginia adopted “Mack” a couple of weeks ago. He took to her right away, and she to him. She’s sent us some great pictures and notes that indicate they are getting along famously. She renamed him “Achilles” which we think is quite fitting. So, one afternoon in June I was out in the back yard with Achilles. We live on a golf course, and there were several groups playing through. The sixteenth tee is just across our back fence, so we pretty much hear just about everything that goes on out there. So, this one group came to the tee–four men probably in their late 50s. The first gentleman stepped up and hit. As soon as his ball was on it’s way, the others all said things like, “Wow, look at that ball!” or, “What a great shot that is!” I thought, “now that must be a good player for those guys to gush like that about his shot.” So I watched to see what the next guy had. He addressed the ball well. He’s played some golf in his time, I could tell. Then he took the club back in a very awkward way, and slashed at the ball stiffly–all arms and little follow-through. I winced for him. “Wow Bob! Great ball man! What a shot that is! Look at that thing go!” His buddies were impressed, I guess, with the results. Then I watched the next two in the group, with similar swings, as they hit their tee shots. The same chorus of encouragement came from their group-mates. Aha! It’s quiet around here this morning. If you know me at all, you know I’m not complaining. Solitude and silence are good for me—life-giving you might say. 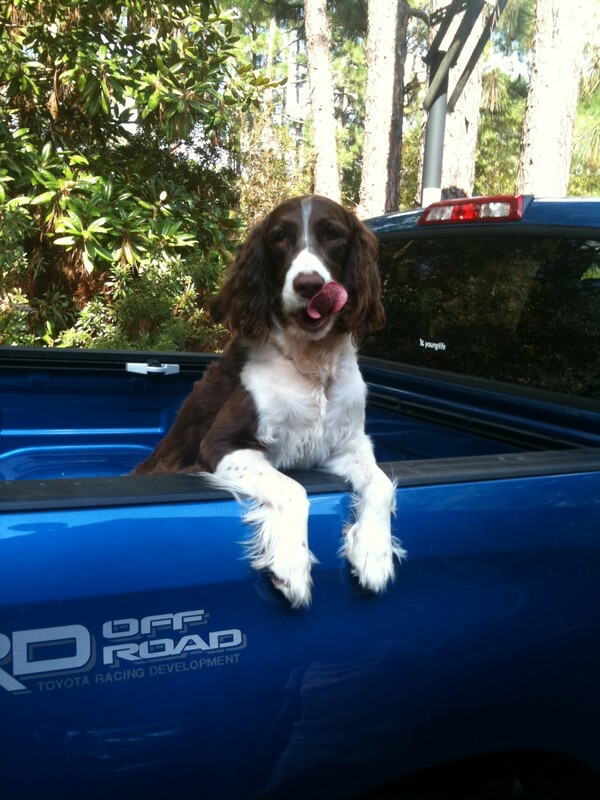 It’s quieter here today because Aoife (pronounced Ava), our nine-year-old Springer has gone to her reward. So, she’s not rustling around in the living room or scratching at the back door or barking at golfers or golf course workers at the back fence. None of that. This “quiet” is one of something missing. Our buddy-dog is gone. Here’s what I think: I think that we live in a culture that dances dangerously close to worshiping the creation rather than, or alongside of, the Creator. That’s unfortunate because it actually reduces proper respect for “nature” and diminishes our enjoyment of the creation. If I look at an airplane and say, “My, what a lovely car,” you’d agree that something is amiss in my thinking. So, to gently frame appropriate thinking toward creation, may I offer a paragraph or few about that? We look at this Son and see the God who cannot be seen. We look at this Son and see God’s original purpose in everything created. For everything, absolutely everything, above and below, visible and invisible, rank after rank after rank of Angels—everything got started in him and finds its purpose in him. He was there before any of it came into existence and holds it all together right up to this moment. And when it comes to the church, he organizes and holds it together, like a head does a body. He was supreme in the beginning and—leading the resurrection parade—he is supreme in the end. From beginning to end he’s there, towering far above everything, everyone. So spacious is he, so roomy, that everything of God finds its proper place in him without crowding. Not only that, but all the broken and dislocated pieces of the universe—people and things, animals and atoms—get properly fixed and fit together in vibrant harmonies, all because of his death, his blood that poured down from the Cross. You yourselves are a case study of what he does. At one time you all had your backs turned to God, thinking rebellious thoughts of him, giving him trouble every chance you got. But now, by giving himself completely at the Cross, actually dying for you, Christ brought you over to God’s side and put your lives together, whole and holy in his presence. You don’t walk away from a gift like that! You stay grounded and steady in that bond of trust, constantly tuned in to the Message, careful not to be distracted or diverted. There is no other Message—just this one. Every creature under heaven gets this same Message. I, Paul, am a messenger of this Message. 2) She’d get up on the chairs or the sofa if she thought we weren’t paying attention. 3) Though she never caught one, she never tired of chasing birds. 4) She let me teach her to sit, lie down, speak, and go to her house. 5) She got upset if people walked or drove carts the wrong direction on the golf course. 6) She somehow figgered she was still small enough to sit in Windy’s lap to watch TV. 8) She liked pancakes on Saturday mornings. 9) She liked bacon juice on her cheap dog food. 10) She looked good in the back of my truck. She looks good in the back of my truck! I was stroking her brow when she breathed her last yesterday, telling her it’d be alright. When life left her eyes I felt the loss of one of God’s works, a companion to me. Windy taught me a lot about life one day when she said that it had occurred to her that Aoife would only get one life, and we should try to make it the best it could be. In that, I learned a good reason to respect the dignity of every human being for the same reason. A pet has given us a glimpse into our mission in our community. Not a bad life’s work, Aoife. Not bad at all. Friends, if you have a pet, I hope you enjoy him, her, or them greatly, stopping short of worship. I hope you perceive your pets to be gifts from God, and that you’ll know Him through his gifts. He is good, and He brings forth good. Peace to your house! Rev. Sam Wells, Dean of the Chapel (can you say Cathedral?) at Duke University, had a great comment about the first folks who ever spoke to Jesus in the Gospel of John. These fellows were John’s disciples. They had heard their mentor’s proclamation, as Jesus walked by one day, “Look, the Lamb of God!” (John 1:35) Surely these disciples asked John what he meant when “you called that guy ‘God’s Lamb. '” They had to know something about who Jesus was, or at least about who John thought he was. I pay attention to a good many blogs these days. Many of them are written by what you’d call the next generation of leaders in matters of the Christian faith. One of the top five things these guys seem to stress in their churches–a core value they have in common–is the idea of Community. Most of their churches do something like “community groups” in order to keep people connected and plugged in. This is no new idea, of course. You’ll see it in the book of Acts, you’ll see it in the writings of Paul, we saw it in the Jesus movement in the 60s and 70s. Where real, vibrant faith is being lived out, people seem to really want to live it out together. This is because, as I’ve written before, we are created for relationships. When we are our best selves, we want to be in community. We want to know and be known. This, in several ways, implies to me the idea of staying. There is value, you see, in the longevity of relationships. If I know someone for a long time, and our lives frequently intersect, I begin to understand what to expect from that other person, and of course they know what to expect of me. If we live in community–that is, if we understand some level of commitment between us–then we begin to be changed by one-another. So, living in community is like that. If I am committed to a community–a church, for instance–then I am going to encounter personalities and opinions and perspectives within that community that challenge me. If I leave when I’m challenged, nobody will learn anything. Jesus, in the Gospels, asks us to work through the hard things. Go ahead and let iron sharpen iron, it’s okay. Working through the hard things makes us all better. It’s the “theology of staying.” If we are developing an ever deepening handful of relationships, our community becomes a much more fertile field in which others may find the comfort they need for the development of their relationships with God, and their relationships with their families and friends. Such a community is brimming over with the aroma of Christ. The Grace that attracts. We’re at the beach, see . . .
Windy and i are at the beach this weekend with Win, Guion, and Abby. This has been our family vacation spot since the boys were very, very little. Back then Windy and i noticed that, near the end of the day–maybe five or six o’clock–the boys would gravitate each to a space of his own and be very content to dig in the sand or whatever. It was sort of mindless activity, it seemed, and we’d watch them, wondering what was going on in their heads. We finally learned to pray that Jesus would wander through their thoughts and leave his footprints there. It appears to be a prayer wonderfully answered. We watched them playing on the beach yesterday. Abby says Guion becomes a six-year-old at the beach. I wonder why . . . ? Peace to you, friends. Miss you all. Our boys had some friends over the other night. (That sounds funny to me because it seems that only yesterday they were too young to know they even had friends!) It was a costume gathering the night before my least favorite night of the year, which usually falls on the last night or so of October. (I dont’ even like to mention the name–and to call it a holiday is a bit of a stretch too, don’t you think?) It was a cookout and hang out party, you might say. At some point when the trampoline had been bounced, the treehouse climbed, the soccer ball kicked, the hot dogs and Pepsi consumed, the older kids (sixth graders) and the younger ones (fourth graders), too, found their own spaces as age groups and settled down for a nice chat. A chat! What do they have to chat about!? i wanted to get close enough to…overhear? Or i’d at least need to be close enough to be able to answer some question that might come up or settle some dispute. Before you could say “refrigerate pickles after opening” the older crowd was off to play moonlight soccer while the younger group went back to the trampoline. As friends in high school, and later in college, a few of us used to sit in Marilou’s driveway and chat like that. Or not. Sometimes we just looked at the sky until one of us was struck by some profound thought, or profound need to visit the facilities. We felt connected as friends just because we’d been in the driveway together. I still feel that connection. Jesus got away from the crowds and went up on a mountainside and sat down. Some of His friends joined Him. As they sat there on that mountainside, a few profound thoughts were planted in the hearts and minds of those simple men. “Blessed are you . . . ” he said. Some real holidays are coming. One for being thankful, one for looking back on a time when God put on skin to come and connect with us. Meet Him in the driveway or wherever. But please, make the connection. Do you remember that song? “Last Night I Had the Strangest Dream” was written in 1950 by Ed McCurdy. It was covered by everybody you ever heard of, from Simon & Garfunkel to Johnny Cash. Being an impressionable kid during the sixties and seventies, i remember its antiwar theme set against the backdrop of the Vietnam Conflict. But get this, “In 1989, school children on the East German side of the Berlin Wall sang “Last Night I Had the Strangest Dream” en masse as the wall was being dismantled.” How would you like to have written that song? If you don’t know the song, grab it on iTunes or someplace. See the lyrics at http://blindbeggar.org/?p=1141 . 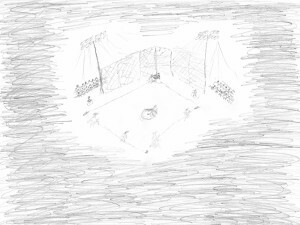 In my dream i was playing in a baseball game. i’ve done this before, when i was just a boy. Played a lot of baseball, but gave it up for other things just before high school. i played other sports after that, but did have a job in the summers as an umpire for the local softball league. In my dream i was playing outfield. This is a position in which one stands all alone with responsibility to cover lots of space. In theory, one should have time to track down a ball and get to it, given that one is so far away from the batter’s box at home plate. This was a night game. And, the outfield wasn’t very well lit. My eyesight being what it is (or isn’t) these days, i could barely make out the fact that there was activity in the infield (where they are much closer to the batter), but i couldn’t really tell what was happening. i could discern lots of movement from time to time immediately following the faintly distinguishable sound of the crack of the bat. i absolutely knew that if the ball came out to where i was, i would never know. It was simply too dark. After one of these flourishes of activity in the infield, there was much cheering, and i could see that the guys on my team were excited and running back to the dugout. This meant the inning was over, and it was our time to bat. i jogged on over. And that probably is it. But as i blinked myself awake, i was immediately impressed more by the experience i was having in the outfield. In baseball, i notice that the most important statistic is a player’s batting average. It’s what he does at the plate that seems to matter most. If he’s a pitcher we track his “earned run average”, if he’s a shortstop we also track how many double plays he’s been involved in. For an outfielder, we track his batting average and how many times he drops the ball. It seems like i work kinda hard these days. Long hours, lots of time on the phone. i think i know what i’m doing, but there’s so much that i just can’t control. Also, i watch my family. i like to think that i know what’s going on–i’m the dad, after all–but to tell the truth, i feel more like a spectator than i do a leader. It all goes on, with or without me.